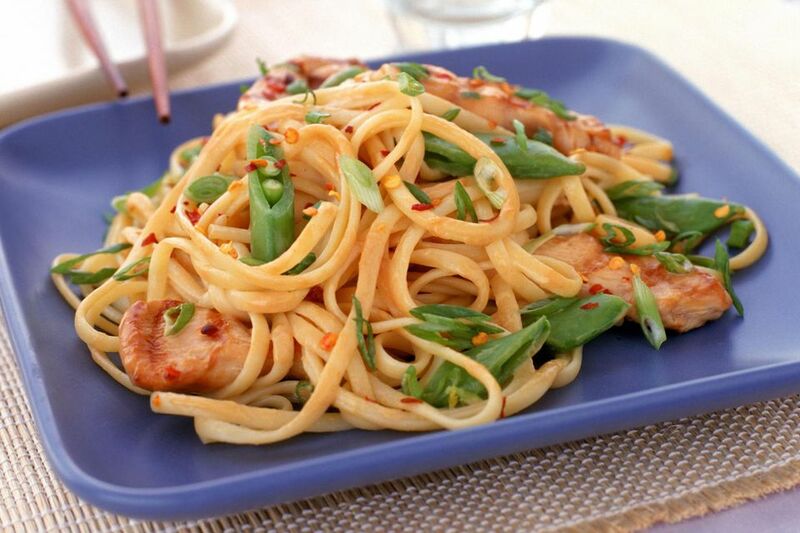 Chicken lo mein makes a great lunch, dinner or late night snack. If you want a thicker sauce, whisk 2 teaspoons cornstarch into the sauce before adding into the wok. Traditionally, this dish is made with thin lo mein noodles (available in Asian markets). Spaghetti or linguini can be substituted, or you can also use thicker noodles if desired. Cut the chicken into thin strips about 2 inches long. (It’s easiest to do this if the chicken is slightly frozen). In a medium-sized bowl, add the light soy sauce, rice wine or sherry, sesame oil and the cornstarch. Marinate the chicken for 20 minutes. While the chicken is marinating, combine the sauce ingredients in a bowl and set aside. Cook the noodles in boiling water until they are cooked al dente (tender, but still firm). This will take about 3 minutes for fresh noodles, and 4 to 5 minutes for dried noodles. Drain, rinse with cold water, and drain again. Cut the carrot into thin strips to match the chicken. Rinse the straw mushrooms under running water to remove any “tinny” taste. Drain thoroughly. Heat 1 tablespoon of oil over medium-high to high heat. Add the garlic and stir-fry for a few seconds until aromatic. Add the chicken and stir-fry until it changes color and is 80 percent cooked. (If you need more oil, try adding 1 tablespoon water). Remove the chicken and clean out the wok. Heat 2 tablespoons oil and the salt in the wok. Add the carrots and mushrooms. Stir-fry for 1 minute. Then add the chicken and the noodles, stirring to mix in with the other ingredients. Add the sauce into the wok, mixing well. Cook for 2 more minutes. Taste and add salt or pepper if desired.